Living through a home renovation can be stressful, especially if you plan to stay in your house while the work is being done. Right from the very start, identify who’s in charge of your project—you, your partner or an outside person, such as a designer. 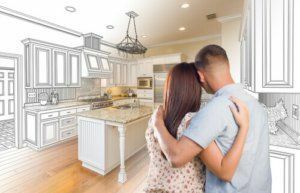 Create a remodeling portfolio with inspiration so that you know what you want your finished remodeling project to look like. Develop a detailed list of items needed before the work starts. Take time to carefully read through the legalities of a contract before you sign with a contractor. This way, there are no surprises later on. Budget for “oh nos”—or, issues that will happen during the renovation. Your neighbors may not enjoy having a dumpster parked in front of their house for months or having their normally quiet street turned into a loud construction zone. Give them the heads up about what to expect with your home renovation. As long as you are considerate, chances are they will be supportive. If it is a major renovation, try to temporarily move out. It can be extremely uncomfortable, if not impossible, to live with this type of work going on for numerous months. Every day, check in with the site supervisor to see how things are progressing with the remodel. They will be more likely to stay on track if they know you are in constant contact with them. If you observe an issue or problem, discuss it immediately. Never wait. After all, the sooner you point out the problem, the easier it probably is to correct. At Republic West Remodeling, we have honed the Phoenix remodeling process for over 18 years in business. It is a very different process than is typical with other home remodeling contractors, and one that aims to get you the dream home you deserve without the pain.